This high fiber recipe combines sweet squash, warm spices, and crunchy nuts to make a unique side dish. The spiced nut crunch recipe will make more than you need for the squash. You can use leftovers to top roasted vegetables, yogurt, or hot cereal. 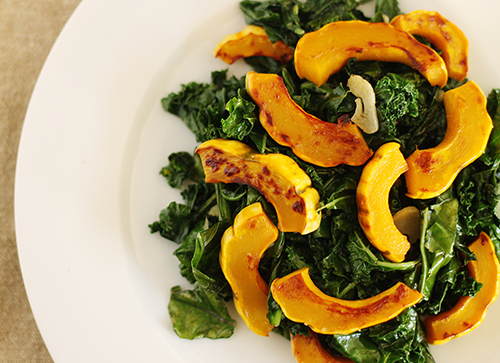 Toss squash with 1 tablespoon olive oil and spread onto baking sheet. Roast 20—30 minutes until squash is tender but not mushy. Combine remaining olive oil, lemon juice, dried spices, salt and pepper in a large bowl. Add squash and toss to coat.